We took this photograph on a cold and misty day during a weekend trip to the North Yorkshire coast of England. Only ruins exist of Scarborough Castle today but they are some of the most interesting ones we have ever seen. The location of the castle itself is tremendously impressive high up on a promentary looking out to sea. In fact, it's believed that the site was used more than 2,000 years ago such are its obvious benefits as a vantage point. 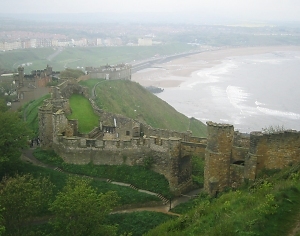 Scarborough Castle was built in the 12th century, a fine example of medieval fortress construction. It later figured in the English Civil War and in 1648, under siege from the Roundheads, its great Keep was damaged almost to the point of destruction. A castle keep was one of the most important areas for defence. Out of the picture but only a matter of a few hundred metres away is a beautiful, small church in whose graveyard is buried the famous writer Anne Bronte. Read more about Anne Bronte's grave in Scarborough. Medieval castles and medieval life fascinate people across a vast spectrum of age and background and for lots of different reasons. Behind medieval-castle.com is a shared interest and enthusiasm amongst 4 friends for all things medieval. One of us has a passion for haunted castles and medieval architecture and another for medieval weaponary for example. Whatever your medieval interests are, we hope you will find something of interest in this medieval blog.